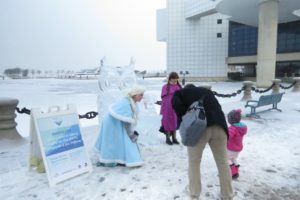 Nearly 260,000 people visited Cleveland’s North Coast Harbor this year for festivals, summer sports in Voinovich Park and other events. That doesn’t include the Clevelanders and tourists powerwalking the East Ninth Street Pier at lunch time or strolling on a summer evening to see a Lake Erie sunset. Or visitors to museums, Cleveland Browns games or the Goodtime III cruise ship. Downtown Cleveland Alliance, which manages the harbor, hosted events in the harbor on 59 days. The harbor had 130 events over the season, including races, parades and special events, like the North Coast Harbor Boat Show, which takes over the Rock and Dock transient marina for a September weekend. The alliance added Bocce ball courts this year and replaced seating. Trees are lit throughout the holiday season. And the first residents have moved into the Harbor Verandas apartments on the pier. The city of Cleveland is planning a $17 million pedestrian drawbridge over the harbor, linking Voinovich Park with the Great Lakes Science Center and Rock and Roll Hall of Fame.